Having a sickly and asthmatic child does not sound like a recipe for business success, but for Margaret Rudkin her son proved to be just that. Rudkin took to baking preservative-free bread, based on a recipe from her Irish grandmother, out of her Connecticut home in 1937, in the hope of reducing her son's allergies. Urged by her son's doctor to market the bread, Rudkin began to do just that, first out of her home, then at local bakeries and markets. Outgrowing her kitchen and then her garage, she built a state-of-the-art baking facility in Norwalk, Connecticut in 1947 and began to expand, becoming the largest independent baker in the U.S. In the 1950s, Pepperidge Farm acquired a frozen pastry company, and secured production and distribution rights for Milano, Brussels and Bordeaux cookies. Rudkin, a self-described perfectionist, oversaw everything from technological innovation to marketing strategies. The television face of Pepperidge Farm for several years, Rudkin also guest-lectured at Harvard Business School. By the time Campbell Soup bought the company for about $28 million in 1961, Pepperidge Farm was selling more than $40 million worth of baked goods a year, up from about $3.5 million in 1950; the company had 1,500 employees working in six plants. 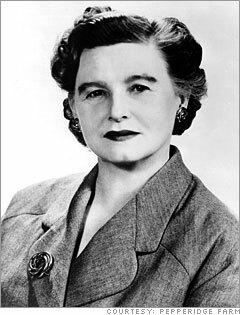 She served on the board of Campbell Soup until shortly before her death.